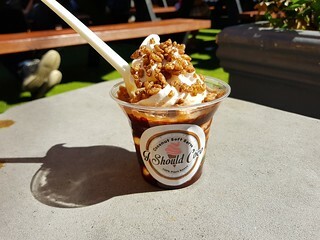 As promised, the recent trip to the August edition of my beloved Brisbane Vegan Markets! You can see my other adventures at these markets here. Once again, I met up with my friends Tracee and Jamie for a lovely morning of eating everything. I had just come from a sweaty bikram yoga class, so cooling down and rehydrating with a refreshing iced tea was just the ticket. 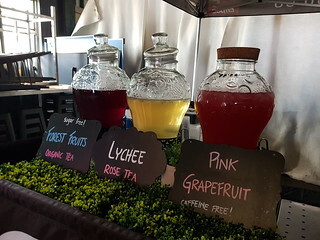 I don't remember the name of the stall, but I enjoyed a lovely Lychee and Rose. Next time I want to try the grapefruit. Our beloved Green Street Foods was away this month catering a wedding, so Tracee got her cheesy pasta fix from Fenn Foods. 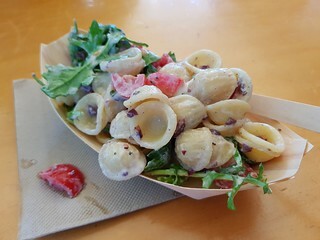 The pasta was coated in their sesame cheese with cherry tomatoes and olives. 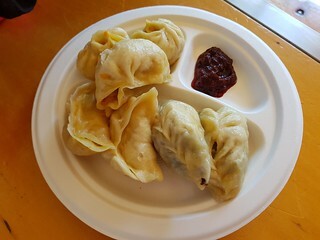 She also got some Momos from Tibetan Momos for her and Jamie. I stopped by the Japanese stall Raijin for some delicious Karaage Tofu, served with some rice and salad, and I added a couple of gyoza as well. So good. I am obsessed with their tofu. Jamie had a cheeseburger (no picture, sorry) from Gatherers that he raved about, so I thought I might try their works burger with pickles. 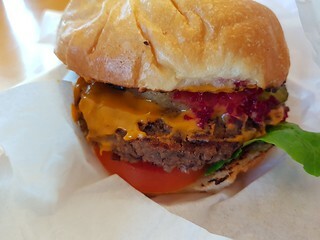 As well as a patty, it had mayo, lettuce, tomato, pineapple, and beetroot relish. The patty was quite soft, but delicious, which led to a messy burger eating. But it was really nice. I wish they had some chips to go with it! Of course, no trip is complete without visiting I Should Coco for a sundae. I tried one of their newer offerings, the It's Popping. This has ice cream, chocolate syrup, chocolate milk, and coco pops. Just like a chocolate milkshake only crunchy... and creamy! Given the chocolate milk, I conceded to logic and got this in a cup rather than a cone. I took home a couple of sweet treats for later. 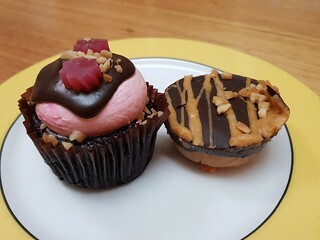 A delicious Rocky Road cupcake from Pippa's Pantry, and a raw peanut butter cup from Bliss & Co. I know what you are thinking - raw peanut butter cup? Most of their food is far to coconut oil heavy for me, they are very helpful with answering questions. But these PB cups have minimal coconut oil, not enough to make me notice or feel sick, and they are super delicious! Little Penny is going to her new home tomorrow! 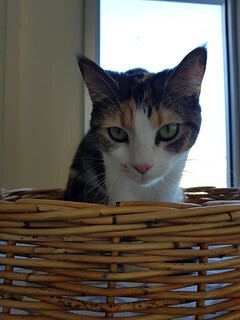 I will miss her sweet little face and funny little fuzzies a lot, but she is going to have such a wonderful home! I had a passing familiarity with Angela Liddon's Oh She Glows blog, but being that I prefer to cook from cookbooks, I hadn't made anything from it. Then The Oh She Glows Cookbook came out, and I was finally introduced to Angela's amazing recipes, right on my table. I really like this book, and you can see some of the other things I have made from it here. Apple Pie Oatmeal: This recipe says it serves one, and one serve is actually quite a filling amount. The apple flavour comes from chopped apple and unsweetened apple sauce (I used slightly less applesauce because that was all I had). The recipe says to cut the apple into 1 inch pieces, but that seemed too big for me, so I cut it into 1 cm pieces, which worked great. I also used almonds instead of walnuts for garnish, because I am not a huge walnut fan. This was a satisfying, not too sweet start to the day. 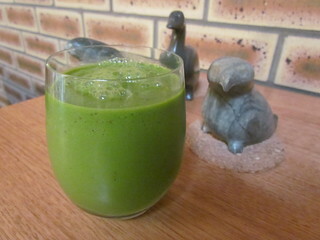 Glowing Mojo-ito Green Monster: This book has several smoothie recipes. This is a refreshing drink, excellent for post-bikram yoga hydration. It uses frozen watermelon, coconut water, apple, avocado, lime, mint, and spinach. It also calls for some ice cubes, but I just used extra frozen watermelon. I also always make sure to chill my apples before adding them to a smoothie, I like everything nice and cold! 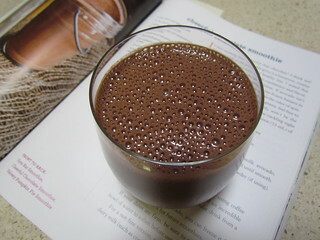 Cheerful Chocolate Smoothie: This really is more like a chocolate milkshake in flavour, which makes it a fun start to the day or any time snack. The original recipe uses avocado for the creaminess, though I took the option to use a frozen banana. 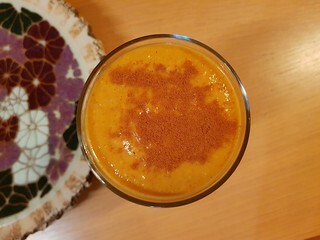 Velvety Pumpkin Pie Smoothie: I had some leftover tinned pumpkin kicking about, so I took the chance to make this. Tinned pumpkin is not something that you can just buy in the grocery store here, I have to get it from specialty shops. To be honest, I prefer the flavour of butternut to the flavour of the pumpkin in the cans, but this had a nice mix of spices and sweeteners, as well as a frozen banana and some oats, which helped smooth out the taste. I got one large glass from this smoothie. I did not take the option to top it with whipped coconut cream, for obvious reasons, but you could if you were into that sort of thing. 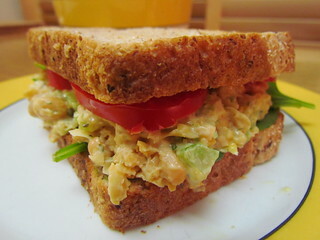 Perfected Chickpea Salad Sandwich: I love a chickpea salad, I want to make them all! 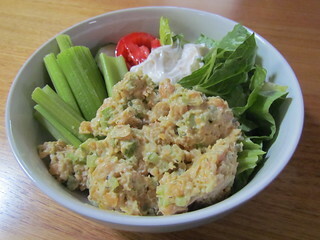 This one was nice and creamy (you can make your own mayo, but I used Vegenaise), with celery, green onion (I just used one small one, rather than three), and dill pickle (though I used a scoop of gerkhin relish, which was what I had on hand). I left out the capsicum. It says that you can add dill as option, but for me dill is never optional. I enjoyed this two ways - one as a salad, but also in a salad bowl with some leafy greens, celery sticks, tomato, cucumber, and an extra dollop of mayo. Indian Lentil-Cauliflower Soup: This book has some lovely soup recipes. 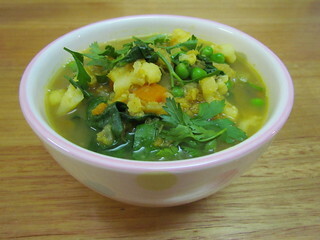 This one is packed full of red lentils, cauliflower, spinach, and sweet potato, and I added some peas as well. It comes together easily, and we got three big servings out of it. 10-Spice Vegetable Soup with Cashew Cream: This makes a lot of soup! It is full of onion, carrots, sweet potato, celery, tomatoes, spinach, and chickpeas. The 10-spice blend is another recipe in the book, which is easy to make. Though technically mine is 9-spice as I left out the cayenne. The cashew cream is mixed into it before simmering. 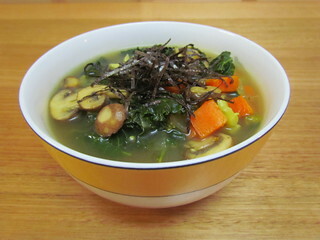 Eat Your Greens Detox Soup: I didn't make this for any sort of detox purposes, I have a liver for that. But after a heavy week of eating out, I was craving something a little lighter and full of vegetables. Onion, mushrooms, carrots, broccoli, and kale are the vegetables (I know, only two of them are green), with some lovely spices as well. I topped mine with some shredded nori as suggested, and a squeeze of lemon juice. 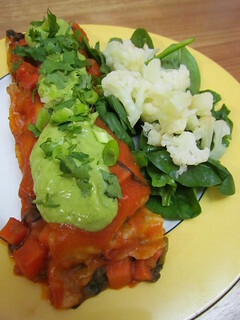 Sweet Potato & Black Bean Enchiladas with Avocado-Cilantro Cream Sauce: I had a hodgepodge of leftover tortillas and wraps of different sizes, so my enchiladas were a little eccentric, but they worked well. This recipe makes enough to fill five regular sized enchiladas, which is an odd number, but so be it. 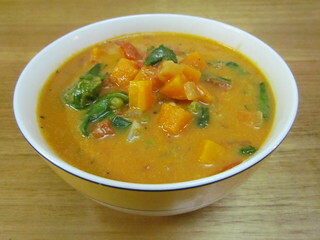 I left out the capsicum and the chili in this recipe, using a little bit extra sweet potato (about 600g). The enchilada sauce is a 5-minute recipe also from the book that comes together very easily, though actually took me about 10 minutes to make. I cut down the chili in that as well. The avocado cream is lovely, I love all things avocado! I served it with some baby spinach and cauliflower on the side. 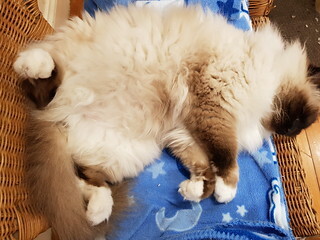 Behold the magnificent belleh floof! 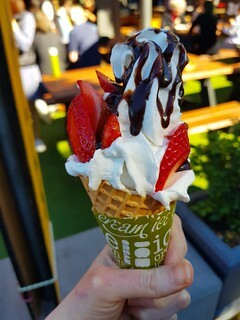 I missed a couple of months of the Brisbane Vegan Markets, but July saw me back again! I made a beeline to try the Parma Burger from Green Street Foods. I breaded schnitzel (I am fairly sure it was tofu) with marinara sauce and cheese on a homemade GF rosemary bun. I am generally not a fan of the GF breads, but Green Street Foods really does such a great job making their buns! This was extremely heavy and filling though, so I didn't have room for much else! I also had some bao from Nonya house - I tried the satay bao for the first time. It was good, though I think I prefer their 'super vegan bao'. Lots of delicious satay sauce though, which was very messy but I managed to clean up every bit of it. Of course I had to get an ice cream from my favourite I Should Coco! I was super full from the burger, so I just got a kid's sized cone. I got one of their new flavours, the Strawberry and Dreamz, which is strawberries, chocolate sauce, and soy whip. It was pretty hard to cram it all into the little cone, so not as pretty as it would be in something larger, but still tasty! 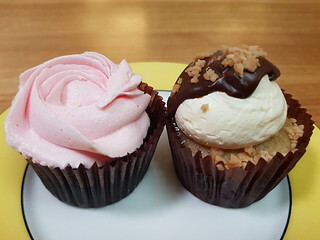 And I also got two cupcakes from Pippa's Pantry - a Turkish Delight, and a Golden Gaytime. I'm not a big cupcake fan in general, but Pippa's are so good that I love trying her range out. My Gizmo. I feel like I don't talk about her enough these days, with Sahara's passing being so much more recent. But I miss this sweet, generous, grounding cat every day. 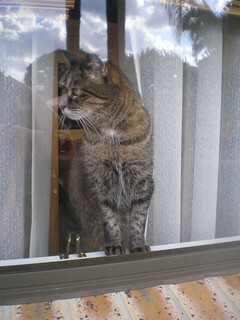 Here she is having a look out of the sunroom window, probably chirruping at some birds. 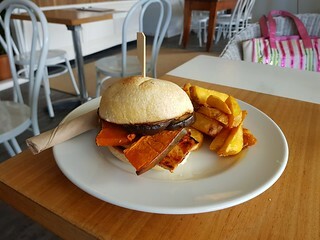 I follow a lot of Brisbane vegans on Instagram, and have an every growing list of places to try. 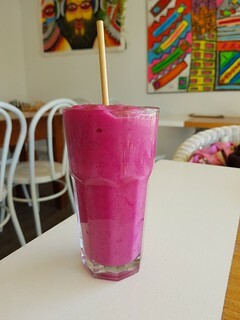 A while ago, my roster changed so that I had a split shift once a fortnight between two clinics, my regular clinic and one that is right near the delightful Two Tables Cafe in Clayfield. Clayfield is not close to my home, so this provided the ideal chance for me to stop in at this cafe for lunch as I moved between clinics. I loved it so much, I kept going back! 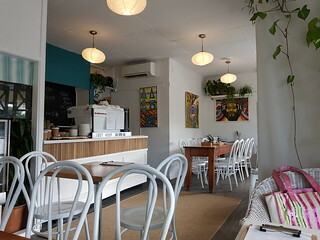 The cafe is super cute, and the service is just so lovely. The second time I went in, the woman who runs it remembered me and my coconut fat aversion, even though I had only been there once before two weeks ago! That sort of attention to customer detail is impressive. The cafe is vegetarian, but with lots of vegan options. Check out how sweet it is! 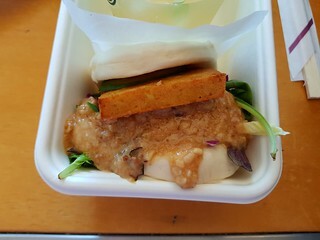 The first time I went I ordered the Tofu Burger, which is eared tofu served with pumpkin, eggplant, carrot, and BBQ sauce. In summer, they make it with a miso slaw, but as it was winter they subbed in pumpkin instead. It was so delicious. I paired it with a Hazelnut Milkshake. 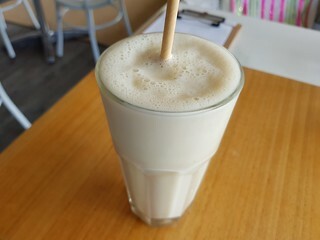 They normally make their milkshakes using Cocolucious coconut ice cream (which is the worst of all the coconut ice creams for me) and coconut milk, but she made it with some frozen banana and soy milk instead. So maybe more like a smoothie, but it was still a creamy, cold, sweet treat. It was a chilly day on my next visit, so I opted for a warming soy hot chocolate. And I was pretty hungry, so I tackled The Works Burger. 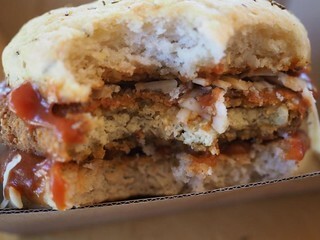 An artisan vegan patty (I believe it is the Fenn Foods Veef Patty), mushroom, tofu, lettuce, tomato, and hash brown with tomato sauce and aioli. 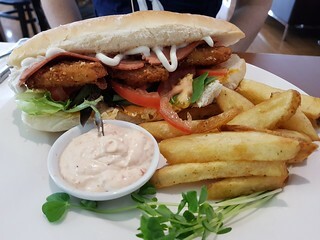 I got it without the raw onion, and I had subbed the tofu in for the haloumi listed on the menu to make it vegan. It was delicious and filling, though didn't leave me feeling sluggish at all. All their burgers also come with a perfect sized serve of chips! My third trip saw me in a breakfast for lunch mood. 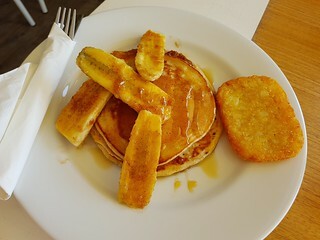 I ordered the pancakes with caramelised bananas, and instead of coconut ice cream they kindly gave me a hash brown instead. Potato at every meal!! I also ordered an acai smoothing, though they were out of acai so offered a pitaya one instead. This was even better, as I love pitaya! Mostly because it is super pink, but it also tastes like fruity candy. Anyway, I am quite in love with this little cafe. 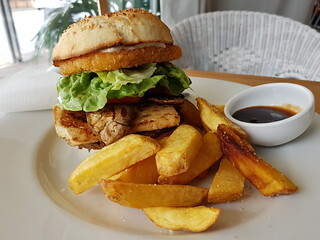 They have recently had a bit of a menu revamp, including some deluxe pancakes, and I am super excited to continue my fortnightly visits and work my way through all the vegan options on the menu. Did I mention that they make all their own bread products in house as well? So good! The only downside for me is that the only vegan sweets they have are raw ones that they order in. The other sweets are generally not vegan (though they do sometimes have vegan baked goods as specials). A little sweet treat at the end would be just right! But that certainly won't be keeping me away! Can you believe that little Penny still hasn't gotten a home? 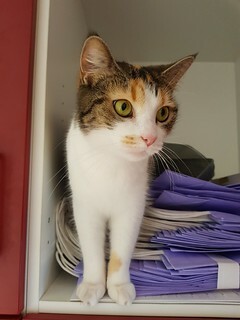 She is so cute! I love oats, so when I heard there was a book dedicated to them I knew I had to have it. 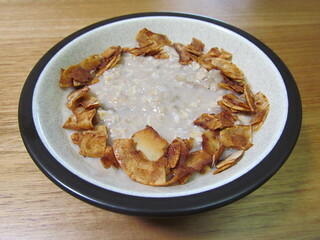 Oatrageous Oatmeals by Kathy Hester is packed full of all sorts of recipes. Of course, there is a hefty dose of warm oatmeals, overnight oats, granolas, and oat bars. But she also has soups, savouries, desserts, drinks, homemade basics, and even beauty products! I haven't blogged much from this book yet, but you can see a few recipes that I have put up in some other posts here. So yes, this book has a whole bunch of exciting oat recipes! 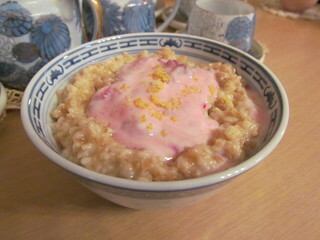 But this post is pretty much all breakfast oats, because they are what I have made the most of. Warm oats on chilly mornings, and overnight oats for a quick breakfast on summer mornings! 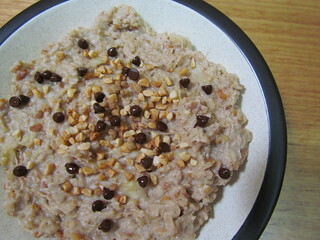 Dianne's Elvis Oatmeal: I love peanut butter, everyone knows this. Peanut butter, banana, and chocolate is a super was to start the day! It said it served four, but I made a half recipe and ate it all for one filling breakfast. I never have vanilla non-dairy milk around, so I used oatmilk (so on theme) with 1/4 tsp of vanilla extract added. I also added a tiny sprinkle of Wayfare Pig Out Grain Bacon Bits for the maximum Elvis experience. BTW, the Dianne in question is wonderful vegan Dianne Wenz! Lemon Raspberry Cheesecake Oatmeal: A fun little combination, the oats are flavoured with lemon and vanilla extracts, and then topped with some raspberry yoghurt. We can't get vegan raspberry yoghurt here (well, maybe there is some sort of coconut yoghurt, but they don't count to me), so I used some Kingland plain green yoghurt with some defrosted frozen raspberries. This recipe uses steel cut oats, for a bit of extra texture. It is pretty small servings, it says it serves three but I would say just one hungry Susan. I needed to add an extra splash of oat milk part way through cooking the oats so they didn't dry out. I also didn't need to add any sweetener, as I found it sweet enough. Kheer (Indian Pudding) Oatmeal: A lovely mix of cardamom, raisins, and saffron (I just used a teeny pinch of saffron, I'm not a millionaire). 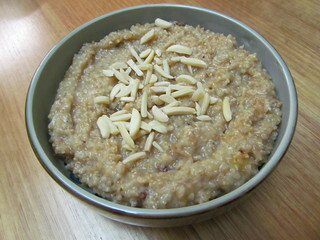 This also uses steel cut oats, and again I needed to add an extra splash of oat milk while cooking. I also left out the optional sweetener, the raisins make it sweet enough. I topped mine with sliced almonds. 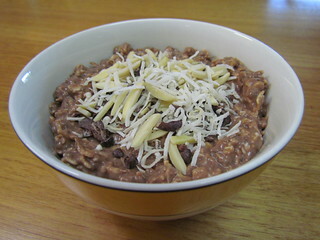 Candy Bar Overnight Oatmeal: This blends chocolate, coconut and almonds together... though I was a little underwhelmed. There aren't any actual almonds in the recipe (though I added some on top), so there isn't much of an almond flavour. I used the option of using plain soy yoghurt and oat milk, and adding vanilla and coconut extracts. Again, I left out the sweetener (which I guess makes it less of a candy bar). I topped it with coconut shreds, almonds, and cocao nibs. 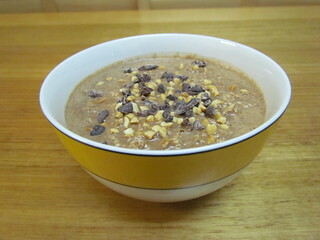 Peanut Butter Cup Overnight Oatmeal: This is one of the 'petite portion' recipes, though I don't hold with that. So I doubled it all to get it to my liking. It is meant to have vegan chocolate protein powder in it, but I don't use protein powders so I added some cocoa for the chocolate flavour. I drizzled this with a little dark agave and topped it with some raw cocao nibs and crushed peanuts. 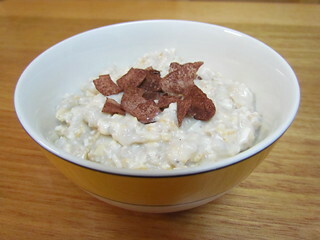 Coconut Cream Overnight Oatmeal: I hear your gasp of disbelief! Susan? Coconut Cream? But no, there was no actual coconut fat in my version because I took the option of using soy vegan yoghurt and oat milk and adding coconut extracts. I actually used some vanilla yoghurt, which was quite sweet so I skipped adding sweetener. Everything here is coconut flavoured, so I did find it a bit one note. Also, even though she uses chia seeds in most of the overnight oats to add protein and make them more filling, this one didn't keep me super full. This is topped with some cocoa-dusted coconut flakes that I got in a subscription box. 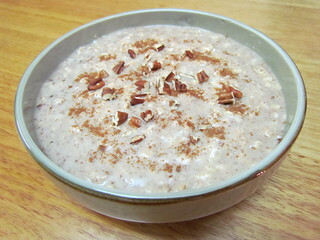 Cinnamon Roll Overnight Oatmeal: Cinnamon, allspice, vanilla, and pecans are added to these oats. All these overnight recipes make one serve, and I added some extra oats to this one. I used plain oat milk, and a tub of vanilla soy yoghurt for my liquids. And of course I doubled the cinnamon - you can never have too much! I topped this with some pecans and more cinnamon. Banana Pudding Overnight Oatmeal: This is another petite portion recipe, but I made this for a little snack so I kept it small. 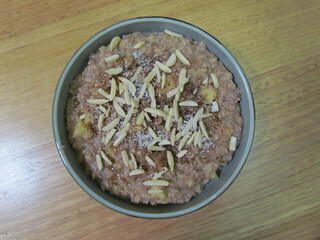 A banana is mashed and added to the oats along with some yoghurt and vanilla. 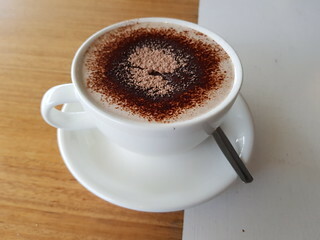 It was nice, and naturally sweet (I didn't add any sweetener). Topped with some sweet and salty coconut bacon flakes because, why not. 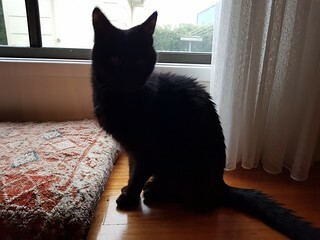 Dim Sim looking so pensive and so cute. But then she is always cute, no matter what she is doing. 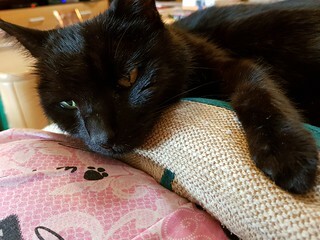 She's had a bit of conjunctivitis lately, and has been not too pleased about having eye medication, but she is a good girl. 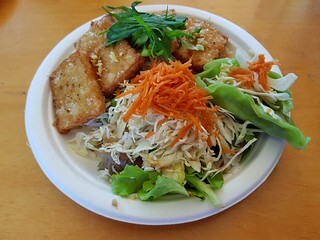 If you are looking for a delicious meal, followed by some excellent vegan shopping, then The Green Edge is for you! Brisbane's original vegan grocery store, it has been through several changes and owners, and has grown into something incredible. Their support for the vegan community and for vegan and animal rescue charities is amazing. What else is amazing? 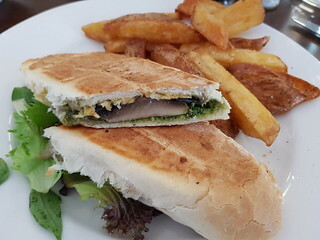 The food they serve at their cafe! Both of these visits in this blog post was when I went for lunch with my BFF Ashleigh. You can see my other visits here. I am a big fan of their juices, they make a nice, refreshing beverage alongside all the rest of the deliciousness. 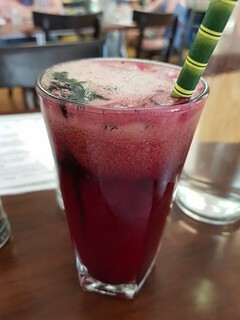 One of my favourites is their Liver Cleansing Juice, that has beetroot, apple, celery, cucumber, spinach, and spirulina. Not for any liver cleaning properties, just because it is tasty. I love beetroot in juice. We shared some of their Salt and Pepper Tofu. This is not what I think of when I think of this dish. 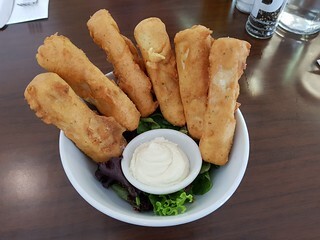 Rather, they are long batons of tofu coated in a salt and pepper chickpea batter. They are very filling, so good to share. Ours were served with some aioli. 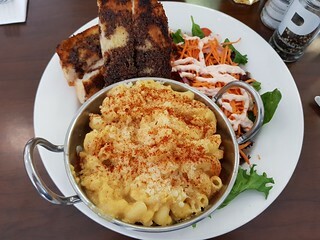 Ashleigh got the Mac and Cheese, which comes with salad and turkish bread. I've had this before and it is a really nice mac and cheese, very creamy. It has happily been added to their regular menu now. I decided to try a mushroom, cheese, and pesto toasty. I keep forgetting that when I eat pesto out, it is always too oily for me. I wouldn't get this one again, though that is due to my own preferences. I got it with a side of their delicious chips. 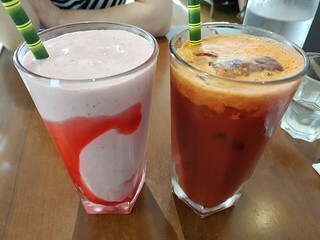 The next time we went, I had the Veg Juice (beetroot, carrot, celery, cucumber, ginger, tomato), and Ashleigh had a Strawberries & Cream Frappe. Unfortunately they use Cocolucious coconut ice cream for all their milkshakes and frappes, which makes me want to die, so I stick to the juice side of the menu. 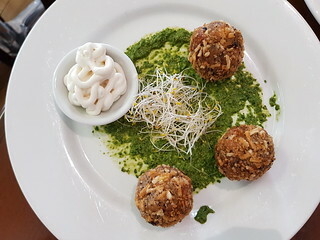 We shared some of their Arancini Balls to start. I'd had these at last year's Christmas dinner, and they were so delicious! I was super excited to see them as a special at lunch. I wish they'd put them on the permanent menu. 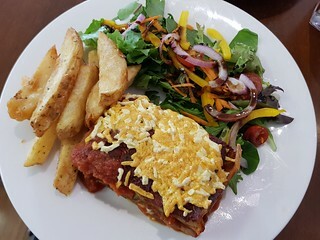 For our mains, I had the vegetable lasagna, which was delicious and came with chips and a salad. This was a special at the time, but has now been put on their regular menu as a pumpkin lasagna. Ashleigh had a Chick'n Tender Sub, which was another special. It used Gardein chicken tenders, which I am not a fan of, but Ashleigh really enjoyed it.